Capacity building can only be defined very broadly; the measures it should include are debated, if not contested. Different methods of delivery belong in the tool-box and it is important to note their different strengths and weaknesses. 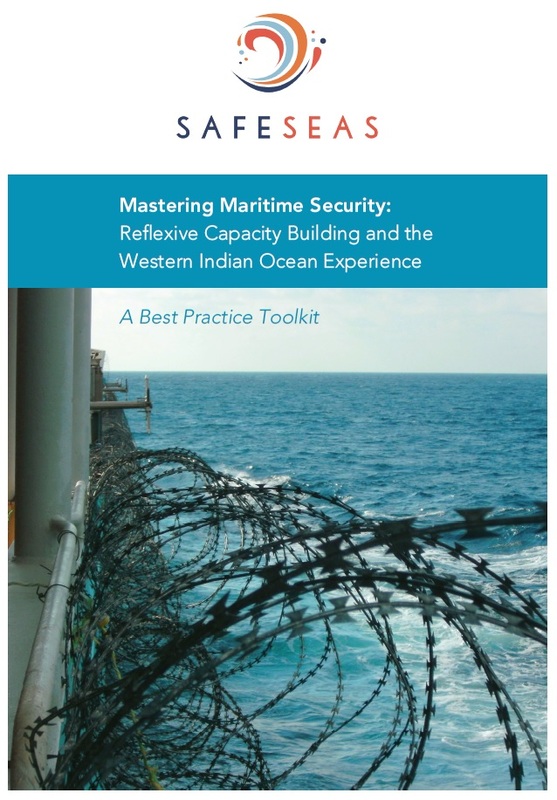 The SAFE SEAS Best Practice Toolkit explores the strengths of different methods of delivery. Measures can firstly be distinguished in terms of their beneficiaries, who can be governmental, organisational or societal. They can also be distinguished by means of the type of capacity being delivered. This can be material, in the sense of delivering a range of specific capacities from blankets to evidence-collection kits, computers, cars, coastguard vessels, buildings (such as prisons or courts) or entire installations such as port facilities. It can focus on human capacity building through education or training. It may also be institutional in nature, including activities aimed at strengthening organisational structures (such as the management of coastguards), legal provisions (such as drafting national laws), or administrative procedures (such as evidence collection or handover procedures). Different types of capacity building can have different time horizons and resource demands, and entail different strengths and weaknesses. Training courses and education programmes: Training courses inculcate specific operational skills in their participants, such as boat handling, navigation, evidence collection or learning how to swim; institutional procedures, such as handovers or information sharing; or norms compliance. Education programmes develop deeper expertise in issue areas, such as maritime law or management. 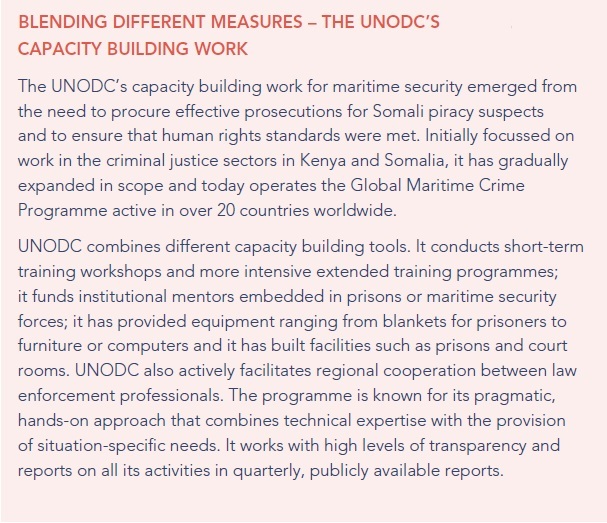 Education programmes and training courses can strengthen the capacity of agencies to understand, plan for and carry out maritime security activities. Such activities can sometimes have the disadvantage of focusing only on a narrow cadre of recipients (such as English speakers or political appointees), rather than the organisation as a whole. They may also represent a poor use of resources if recipients later leave their posts or are side-lined by their superiors. Matching training with existing resources is important; training coast guards in boat handling and maintenance skills, for example, will have little impact if they have no boats available to actually use. Mentoring: Mentoring involves the pairing of external advisors and agencies with the aim of offering support, advice and expertise, particularly to the leadership. Mentoring is a long-term activity and requires a relation of trust between mentors and mentees. To succeed, the mentor requires a good understanding of organisational routines and an awareness of their potential to change. When done well, it can provide an on-going channel for knowledge-exchange between mentors and mentees, often focused on real-world problems as they arise. Mentoring can be a demanding activity. It requires a lasting commitment from donors, and the identification and secondment of suitable expert mentors with the ability and commitment to engage substantively with their mentees. Mentors may also require specialist language skills. Provision of equipment and infrastructure: Equipment provision has a number of advantages. It tends to be readily appreciated by recipients, it provides a concrete capacity that can be left behind when the donor leaves and represents a relatively uncomplicated deliverable. Infrastructure provision can represent a concrete and visible commitment to capacity building on the part of donors. It can also provide important facilities – such as prisons, courts or ports – that a country may be unable to build or resource themselves. However, the provision of equipment or infrastructure on their own may have little substantive impact if agencies do not have the resources, skills or available personnel to utilise or maintain it. Consequently, such donations are rarely enough on their own, and should be accompanied by appropriate training activities and integrated maintenance provision. Workshops and table-top exercises: Workshops and table-top exercises can facilitate knowledge-transfer and exchange between donors and recipients. They can also encourage relationship- and network-building, and are relatively inexpensive and straightforward to organise. They are also easy to get wrong, however. As with training and education, they can often focus on a small group of English speakers who attend multiple events, at the expense of engaging the organisation more widely. Their short-term nature – sometimes lasting only a day or an afternoon – means they can be overly generic and insufficiently sensitive to needs. The relative ease with which they are organised can also lead to multiple different events by different donors, often on very similar or even duplicate subjects. This in turn can saturate the local environment with activity and prove a drain on resources, with personnel attending workshops rather than going to work. It can also lead to fatigue and cynicism on the part of the recipients themselves.